Fog lights can illuminate the area in front and around your vehicle in poor weather conditions like fog, snow, heavy rain, dust storms or smoke. This makes driving safer and easier. When used under the correct circumstances it can provide clear vision for the driver in difficult visual circumstances and also make you more visible to other road users. OPT7 has been one of the leaders in the LED fog light market for the last few years and the OPT7 FluxBeam LED Fog light is a superior addition to the fog light family. These LED fog lights are reported to burn five times brighter than Halogen bulbs and also 12% brighter than HID (High Intensity discharge) lights and thus makes them stronger than most competitors. Since the bulbs are so powerful the heat generated is more. Therefore, these lights are designed with a cooling system: OPT7’s Modular Heat Protection Technology. This includes a 7000 RPM TurboCool fan which gives twice the normal flow rates (deliver 5CFM of air flow) and a compact Redline Cool ASIC-X LED Control Driver to keep the heat down. This results in longer working hours for the LED bulbs. Part of the Modular Heat Protection is Cold Pressed Aluminum Heat Sink, which provides better heat dissipation. 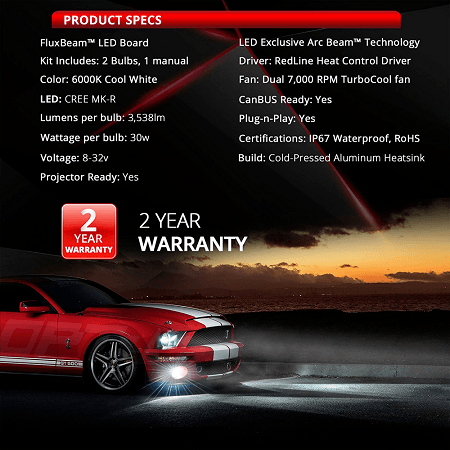 The OPT7 FluxBeam fog light also has the Advanced Bright LED board design which synchronizes with the Redline Cool Control Driver to provide steady output and increase the heat protection feature. The color of the LED light is Clear White with a touch of Xenon blue and a Kelvin color temperature of 6000K, which is great. Since it has LED lights, the working lifespan are very long, up to 50 000 hours to be specific. This results in less bulb changes and less fuss with regards to maintenance. 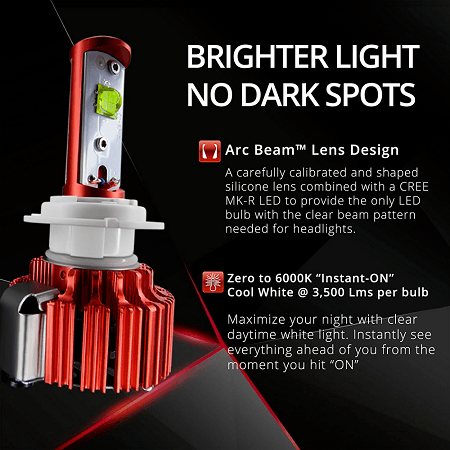 The OPT7 FluxBeam Fog light is engineered with exclusive Arc-beam Technology. This is designed around the CREE MK-R LED light which ensures the correct beam patterns. The result is improved clarity with focused lightning beams and less scattered beams. This implies no dark spots, short beams or non-linear beams. It is water resistant with an IP67 rating, meaning that it could be immersed in one meter of water for 30 minutes. This makes it rain proof and the cyclone fan will work even in harsh weather conditions. Another useful feature is that these bulbs are CanBUS-Ready which implies that they work the first time and load resistors are not needed. It is marketed to work with any vehicle’s computer system without difficulty. The installation process is quick and the bulb clips in easily. 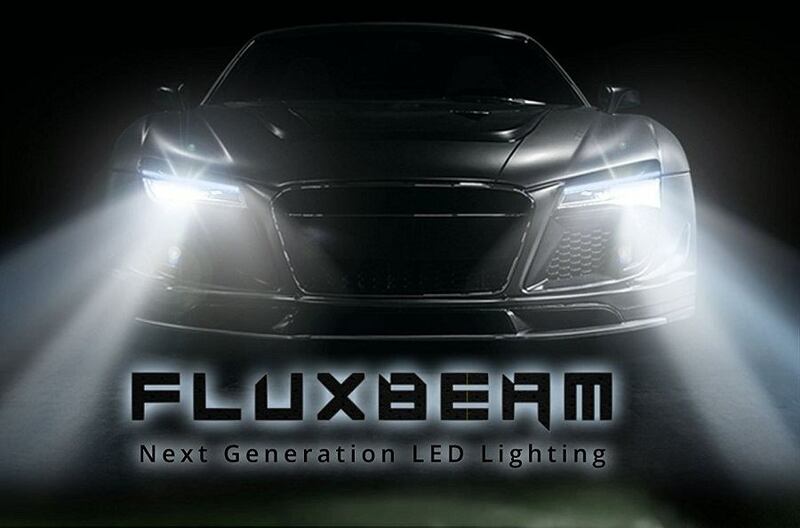 It should be noted that the flux beam bulbs can only replace original manufactured halogen bulbs and can’t be used to replace OEC HID or OEM LED headlights. This is a popular fog light and an average of 71 % of customers gave it a 5-star review. Main advantages are the excellent quality and the fact that it is a very bright light. The efficiency of the light is many times more than the user expected. The installation is reported to be easy and can be done at home. Most customers have had a good customer service experience with OPT7 as well as good technical support and they apparently replied promptly to emails. Another advantage is that most users report that the fog lights are not blinding to oncoming traffic with indirect viewing, and that it is only blinding when looking directly into the lights. Although a quality light, it comes at a hefty price of about 100 USD. Since fog lights are something that most drivers do not use on a regular occasion, it might not warrant such expensive lights. However, if you want one of the best products available and do not care to pay for it, this is an excellent choice. The minority of customers have complained about the workings of these lights. Some have had issues with the fittings e.g. that it did not fit their particular type of vehicle. One of the advertised benefits is that they fit all vehicles, which seems to not be entirely true. Some have also report water leaks inside the lights and another complaint was the lack of a customer support telephone number, since you are only able to contact OPT27 via email. 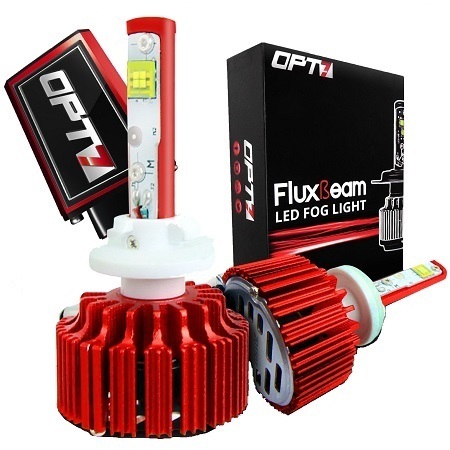 The OPT7 FluxBeam Fog light sells for around 100 USD and are available at online stores. It is advised to use a reputable site like Amazon which offers not only secure payment options, but can also assist you with returns and technical difficulties. The OPT7 FluxBeam Fog light is a leader in its class in terms of brightness and efficiency. It is excellent quality fog lights and provides long working hours without needing to replace bulbs regularly. If you are willing to pay more for better quality, the OPT7 FluxBeam Fog light is the way to go.